Current controller – Strobe mode – 1 channel. 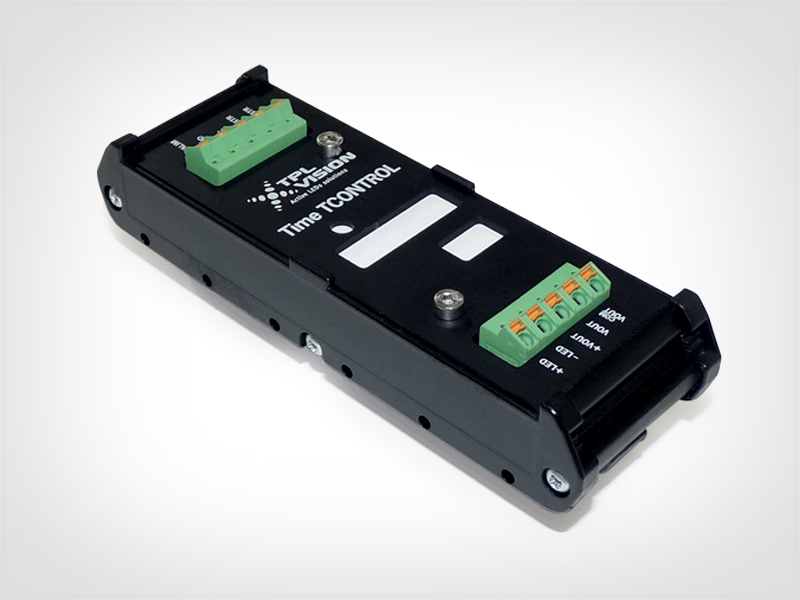 The Time TCONTROL is an electronics module that enables the control and the regulation of current in TPL Vision’s led lightings manufactured without electronics (SE), only in strobe mode. Thanks to the Time TCONTROL, you can supply the lighting with power, regulate the current, control the rising time and control the camera triggering (from 5 ms to 1 000 ms). The Time TCONTROL is equipped with 2 switches: switch 1 for the current setting and switch 2 for the rising time control. According to the kind of lighting, the Time TCONTROL has to be supplied with a voltage situated between 7 VDC and 28 VDC. Thanks to a delayed-action output (PNP or NPN), it enables the triggering of the shooting at the most relevant time, when the lighting intensity is stabilised.